When her mentor disappears, Winter follows his trail to the Pacific Northwest, where the untamed wilderness is beautiful…and hides deadly secrets. Anthropologist Winter Barstow knows nothing of her past or ethnic heritage and tells herself it doesn’t matter. Everything changes when Doc, her mentor, sends her an authentic ceremonial wolf mask from Olympic National Forest. The mask calls to her in ways she can’t understand or explain. Then Doc disappears. Determined to find him and discover the mask’s origin, she travels to the mysterious, awe-inspiring forest where she’s confronted by Native American ranger Jay Raven, who has no love for Doc. The deeper Winter digs into her mentor’s disappearance, the more alarming things become. She begins to hear a mysterious wolf’s howl…even when no one else does. Jay warns Winter to leave, but she owes Doc and herself the truth. And even though it goes against everything he has promised his tribe’s elders, Jay can’t walk away from Winter. Not only has a spirit wolf reached out to her, but he also suspects she’s in terrible danger…and his growing feelings for her are too strong to ignore. This is an intense and exciting murder mystery. I loved the overwhelming sense of place in the rainforests of the Pacific Northwest and I enjoyed the convincing and well researched First Nations voices, beliefs, and traditions captured in this story. When her professor disappears in Olympic National Park, Native American anthropologist Winter leaves California to search for her mentor. Unwittingly, she stumbles into conflict between her academic world and the Native Americans who do not want researchers on their land. Winter’s personal conflict between her academic interests and her personal history and identity is fascinating and I really enjoyed watching her reevaluate her loyalties and priorities as the story progresses. The mystery is genuinely frightening. The expanse of the forest, combined with an intense sense of claustrophobia creates tension as Winter finds herself surrounded by characters she doesn’t trust, and fears she will be the next victim. I enjoyed the supernatural elements of this story – there is a sense of foreboding that creates unease from the first pages and I loved the eerie feel to the story. There is some romance between Winter and Jay, but I most enjoyed their friendship. They work well together as they investigate the murders and I enjoyed the contrast between their experiences as Native Americans. Having grown up not far away from Olympic National Park in the Canadian Pacific Northwest, I was awed by how well the writer captures the atmosphere of the dense temperate rainforests. Her Aboriginal characters are respectfully drawn as she explores conflict between generations and demonstrates an understanding of some of the issues facing the people she writes about. This is a fantastic story and I look forward to more from this author. Vella Munn writes because the voices in her head demand it. She has had upward of 60 titles published both under her own name and several pen names. A dedicated hermit and shopping loather, she’s married with two sons and four grandchildren. She’s owned by two rescue dogs. 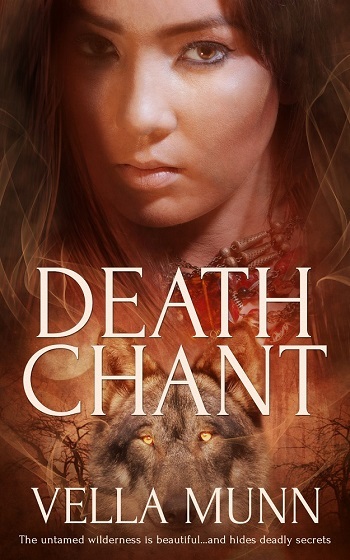 Reviewers on the Wicked Reads Review Team were provided a free copy of Death Chant by Vella Munn to read and review.